The soul of a society rests on the shoulders of its artists. 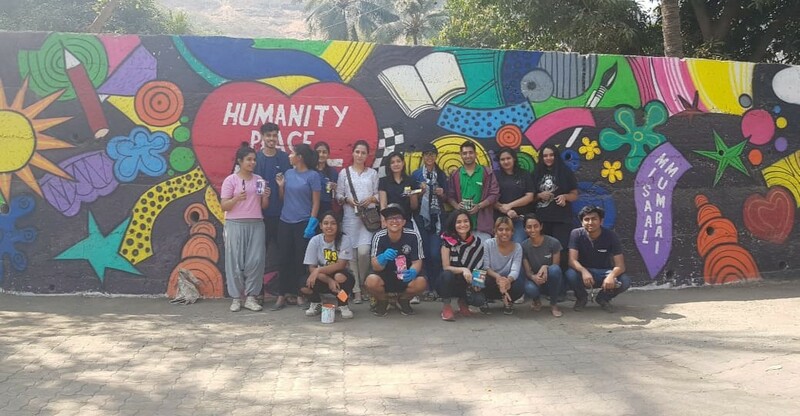 Adhering to the message, students of Whistling Woods International (WWI) School of Creative Arts contributed to two key initiatives working towards the beautification of Mumbai. Through their partnership with the Kala Ghoda Association and Misaal Mumbai, these students helped ignite a change in Mumbai’s soul. On the other side of the city, students of the Visual Communication Design department were working hard to bring colors into the lives of Mumbai’s most deprived residents. Misaal Mumbai is an initiative conceived by artist and social worker Rouble Nagi. Beginning as the first slum painting initiative in India with ‘Paint Dharavi’ in 2016, the programme has quickly grown with more than 43,000 houses painted in various slums and villages. The students of the Visual Communication Design department volunteered for a drive held at Reti Bunder, Mumbra. Over the course of this event, they connected with the community and interacted closely with its residents, creating engaging visuals that uplifted the surroundings and gave it a new life. Whistling Woods International is India’s premier Film, Communication, and Creative Arts Institute. Founded by one of India’s leading filmmakers – Subhash Ghai, Whistling Woods International (WWI) is one of Asia’s largest Media Arts institutes. ‘The Hollywood Reporter’ has rated Whistling Woods International as one of the Ten Best Film Schools in the world in 2014, 2013 & 2010. WWI offers courses that vary in duration from 1 year to 3 years catering to all major verticals of the Media & Entertainment industry, namely Acting, Animation, Cinematography, Direction, Editing, Music, Producing, Screenwriting, Sound, Visual Effects, Media Management, Fashion Design, and Visual Communication Design. All the courses are accredited by the Tata Institute of Social Sciences (TISS).